FILE - A man walks along the Indian Ocean as the tide goes out at Coco Beach in Dar es Salaam, Tanzania, Oct. 31, 2014. Fish need oxygen to breathe as much humans do, and two new reports say there is less and less of it in some of the world's oceans. According to the U.S. National Center for Atmospheric Research as changes in winds and temperature caused by global warming lead to warmer surface water temperatures, the oceans are absorbing less oxygen. There are already a number of areas -- so called dead zones -- where fish don't have enough oxygen to live and either die or swim to safety. Cold water absorbs and holds more oxygen than warm water, so as the water continues to warm the report predicts nature’s ability to replenish the loss may become overwhelmed by early 2030s. 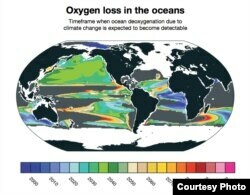 In its latest study, published in the journal Global Biogeochemical Cycles, the Center says deoxygenation can already be seen in some parts of the Pacific Ocean. Scientists warn even if we curb the present level of CO2 emissions, the damage to marine ecosystems may already have been made irreversible.